BBC NEWS | Europe | Madrid blasts: Who is to blame? Madrid blasts: Who is to blame? 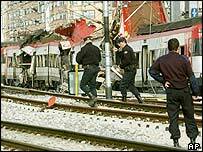 In the immediate aftermath of the blasts, the Spanish authorities had no hesitation in blaming Eta for the bloodshed. On Friday, Spanish Foreign Minister Ana Palacio re-stated the government's stance, saying: "Everything appears to indicate that this terrible carnage is the work of Eta." Eta itself has reportedly denied involvement in the attack, through anonymous phonecalls to Basque media used previously for announcements by the separatists. Ms Palacio acknowledged the possibility that Islamic radicals were behind the attack, saying it was a hypothesis that the government was examining. However, there were "very strong clues, very strong precedents" to indicate it was the work of the Basque separatist group. If Eta was responsible, analysts say, the simultaneous attacks mark an unprecedented increase in scale, ruthlessness and co-ordination. Before these bombs, many observers had been tempted to write off Eta as a spent force. Last year, three people died in violent attacks by Basque nationalists - the lowest total for 30 years. There is no doubt that the Spanish government's uncompromising efforts to crush Eta and refuse all political concessions to Basque nationalism have greatly weakened the separatist group. Experts are in sharp disagreement over whether Eta in its current state has the capability to mount such a devastating attack. Sebastian Balfour, professor of contemporary Spanish studies at the London School of Economics, told BBC News Online that high-profile arrests of key leaders had reduced the number of Eta activists to no more than 250. And intelligence analyst Glenmore Trenear-Harvey, interviewed by BBC News 24, said the group would have found it difficult to stage such a co-ordinated effort, given the level of surveillance to which the remaining Eta members are subjected by the Spanish intelligence service. "To organise something with this number of bombs requires an amazing amount of legwork beforehand," he said. But Mia Soar, Europe editor for Jane's Sentinel Security Assessments, believes a crackdown by both the Spanish and French governments might have produced a new and more ruthless Eta leadership. "There have been so many arrests that there has been a constant turn-over of the leadership... they have a lot of young blood at the top. This could explain the new tactics," she told BBC News Online. Another analyst who blames Eta is University of Kiel security expert Joachim Krause. "Even though Eta has been partially wiped out, there is still a radical core that has survived and this core apparently has no qualms about killing mass numbers of people," he told Reuters news agency. However, one leading Basque separatist politician, Arnaldo Otegui, has argued that the apparent lack of a bomb warning in Thursday's attack is not typical of the group. "Eta has always issued a warning whenever it left a bomb to explode," said Mr Otegui, who formerly led the banned Basque separatist party Batasuna. And even more mainstream Basque politicians, such as moderate nationalist Juan Jose Ibarretxe, are unsure of Eta's involvement. Mr Ibarretxe, who is prime minister of the Basque region, said there existed a "reasonable doubt" as to who was behind the attack. 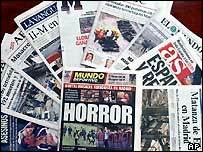 Few people are inclined at the moment to say categorically that the Madrid bombings were carried out by the Islamic militant network al-Qaeda. More typical is Richard Evans, editor of Jane's Terrorism and Insurgency Centre, who told Reuters: "It would be premature to rule out at this stage the possible involvement of Islamic militants like al-Qaeda or the wider international jihad." George Joffe, of the Centre for International Studies at Cambridge University, said on the BBC World Service's World Today programme that he had initially believed Eta was responsible, but was now having second thoughts. "It may yet be that this is part of a much wider conspiracy, and it's certainly true that Spain has in recent weeks arrested large numbers of North Africans, accusing them of being connected with al-Qaeda," he said. The BBC's security correspondent, Frank Gardner, says the UK's Joint Terrorism Analysis Centre, based in the headquarters of the MI5 intelligence service in London, has been analysing the possibility of al-Qaeda involvement in the attack. Speaking on BBC Radio 4's Today programme, he raised another possibility - that there may have been collusion between an Eta splinter-group and Islamic militants sympathetic to al-Qaeda. "It would be unusual, because al-Qaeda don't feel comfortable working with non-Muslims, but it's possible that two splinter-groups could decide to pool their resources in this devastating attack," he said. "Eta denies responsibility, but can we believe the denial?"